Very bright Hickson group. Worthwhile! 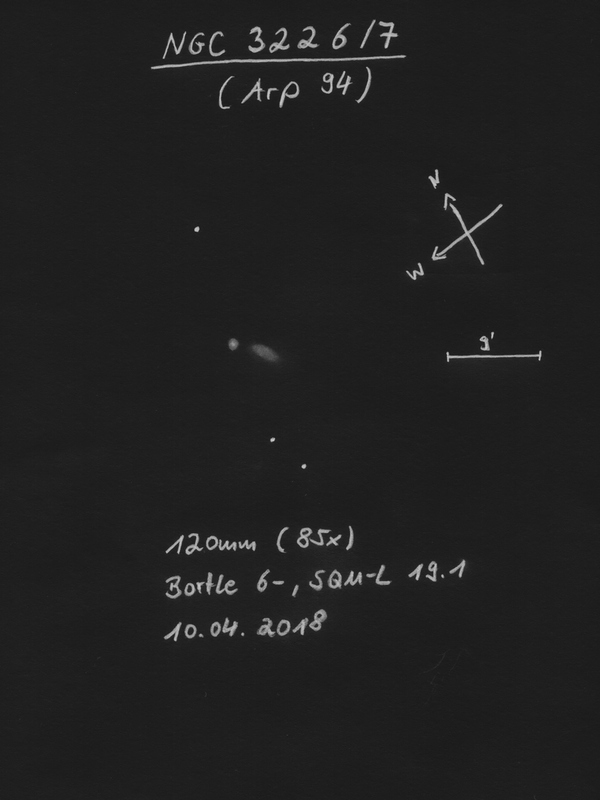 The two brightest members were apparent with averted vision: NGC3193 appeared roundish with brighter core, NGC3189 very elongated with also elongated, brighter core and fainter, diffuse outer region. NGC3185 perceptible with averted vision as fairly faint, roundish, evenly bright nebula. NGC3697A: Brightest member of the group. Elongated, evenly bright & wide. NGC3697B: Roundish, slightly condensed. Overall pretty faint. Located northwest near NGC3697C. Fairly thin, elongated, nearly evenly bright. Barely seen with direct vision. At 100x the core is brighter and seems also slightly elongated. Thin, elongated with slightly elongated, brighter center. Located on the bottom left of the sketch. Slightly elongated, very faint, evenly bright. Obviously oval, evenly bright, fairly faint. Evident with averted vision. Oval, brightening toward the middle. Seen with direct vision. Barely visible with direct vision. At 50x just a faint glow, at 75x oval, faint and evenly bright. At 23x pretty small, oval, evenly bright. At 48x slightly condensed and barely visible with direct vision. Round, evenly bright. Rather well visible with averted vision. At 48x rather small, roundish to slightly oval, evenly bright. At 66x slightly oval, getting a bit brighter towards the middle. Easily held with averted vision. Roundish, evenly bright, faint. Tried at 75x and 112x. Fairly well seen with averted vision. Very elongated with also elongated, brighter core. Blending diffusely into the background toward the edge. Only the brighter core area was seen. Fairly well seen with averted vision as elongated, nearly evenly bright nebula. Apparent with averted vision. Round with brighter core. Roundish with brighter core. Fairly well seen with averted vision. Pretty faint, round, slightly condensed. 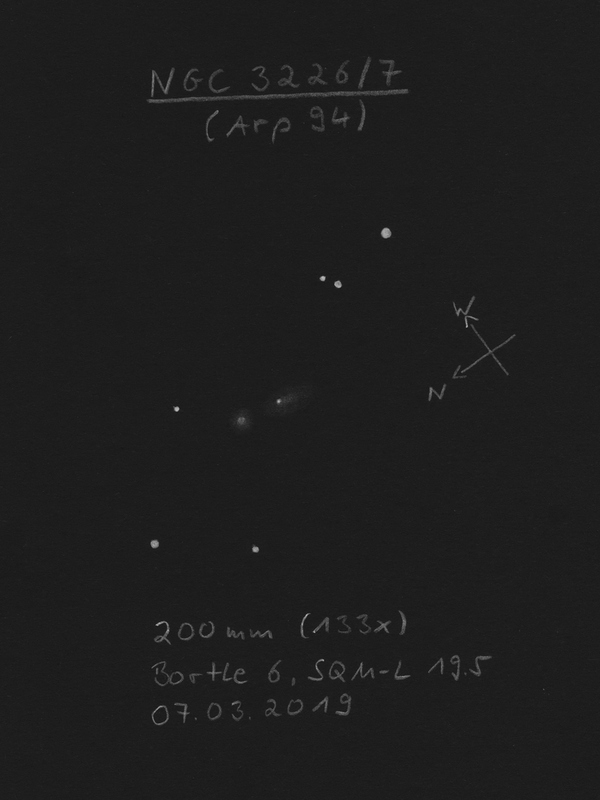 At 30x together with NGC3227 already visible as very faint, elongated brightening. At 133x roundish, well condensed with a quite compact center. Overall brighter than NGC3227. Very faint, oval, evenly bright. 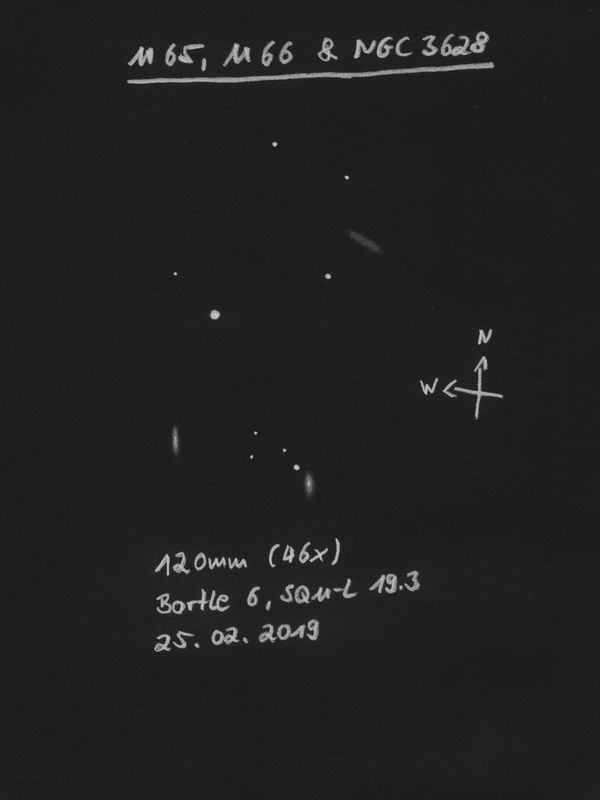 At 30x together with NGC3226 already visible as very faint, elongated brightening. At 133x slightly elongated, getting slightly brighter towards the middle. North of the center a stellar brightening was visible. Already seen at 28x as very faint nebula. 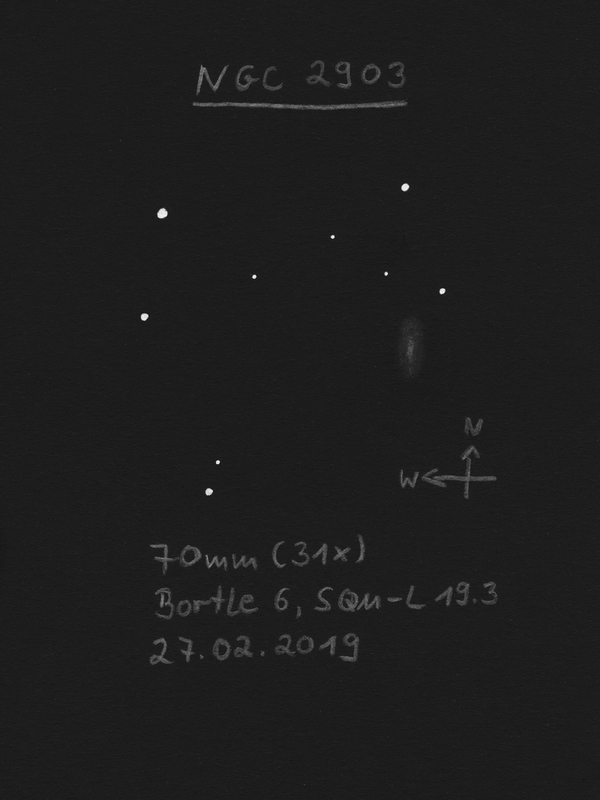 At 75x fairly well seen with averted vision, faint, evenly bright, very elongated. Elongated, without distinct core, slight darkening toward the edge. With averted vision I think I saw in one moment the dust lane, but not for sure. Due to nearby street lamps I wasn't able to get fully dark-adapted. Pretty faint, elongated, evenly bright. Located on the upper right of the sketch. SQM-L 21.0: Roundish (? ), faint. Brighter and larger than NGC3748. SQM-L 21.0: Faint, roundish, pretty small. SQM-L 21.0: Difficult to separate from brighter NGC3753. Just visible as very faint, roundish brightening. SQM-L 21.0: Slightly elongated, rather evenly bright, pretty faint. SQM-L 21.0: The apparent attachment northeast of NGC3753 was absolutely not seen. SQM-L 21.0: Compact, round, evenly bright.